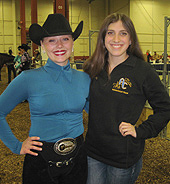 From Grayslake, Illinois, Madison Miller of the University of Wisconsin at Madison (on right) was one of five Region 4 hunter seat riders to qualify for 2018 IHSA Nationals. Seen here with head coach Sable Bettencourt, Miller closed out her senior year by placing eighth in individual open on the flat at Nationals in Harrisburg, Pennsylvania on May 3rd. This made Miller the only rider of the five qualified to earn a top ten ribbon. On April 8th Miller won her final undergraduate IHSA blue ribbon in the same division at Zone 7 Zones in Springfield, Missouri. We are not sure which schools Michelle Grevengoed of Augustana College rode against during the regular season, but in the end she found herself at IHSA Nationals entered in the individual advanced western division. So few schools in Region 4 had western teams in recent seasons that the few schools that do are sent to other regions to show western. Seen here with team captain Elizabeth Elberts, Grevengoed (on left) was third at the Galva, Illinois Semifinal. From Chadwick, Illinois, Grevengoed finished her junior year by placing 10th in advanced western at the Pennsylvania Farm Show Complex in Harrisburg, PA at Nationals on May 6th. You go first! 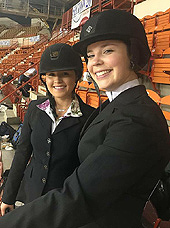 From Menomonee Falls, Wisconsin, Kristina Neitzke of the University of Wisconsin at Milwaukee (on left) was the first Region 4 rider to compete at 2018 IHSA Nationals. 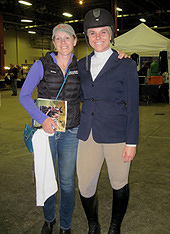 Seen here with head coach Lisa Behling, Neitzke competed in the third class of the day in Harrisburg on April 3rd, which was individual novice over fences. Neitzke just missed the top ten, as her over fences judge's score of '72' was one number from the tenth place rider. Neitzke had placed second in the division at Zone 7 Zones at the Darr Agricultural Center in Springfield on April 8th. Those lucky Badgers! They have not only won the Region 4 Region Title every year since the region was created from the old Zone 9, Region 3 in 2010 they even had two riders entered at 2018 IHSA Nationals. 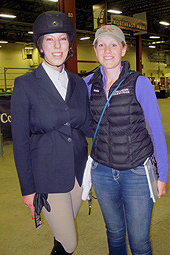 Prior to Miller's ride, University of Wisconsin at Madison teammate Elizabeth Evans (on left, with coach Bettencourt) competed in individual novice flat at Nationals on May 3rd. From Downer's Grove, Illinois, it was the final undergraduate ride for Evans. On April 8th Evans was the Zone champion in the individual novice flat division. The University of Notre Dame/St. 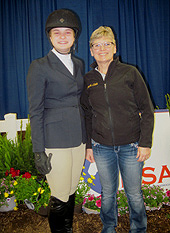 Mary's College combined team also had two riders entered at IHSA Nationals. While this writer had intended to take a photo of each he missed out on individual intermediate flat rider Jane Henry (on left). Teammate Annabelle Goese (on right) was in another picture but thanks to head coach Kerry Hilgendorf (not pictured) we present a photo of both riders. Hilgendorf took this photo in the stands of the Pennsylvania Farm Show Complex prior to both of their rides. Henry and Goese were out of the ribbons in their final IHSA undergraduate rides on April 3rd in Harrisburg but both had placed second in their respective divisions at Zones nearly a month earlier (Goese was second to Evans in individual novice flat in Springfield, which was the only time Region 4 riders held the top two spots on April 8th). Schools competing in Zone 7, Region 4 during the 2018-2019 school year: Augustana College, Iowa State University, Lake Forest College, Marquette University, Northwestern University, Purdue University Northwest, Ripon College, University of Notre Dame/St. Mary's College (IN), University of Wisconsin at LaCrosse, University of Wisconsin at Madison, University of Wisconsin at Milwaukee and University of Wisconsin at Platteville. Schools in Zone 7, Region 4 with Western programs compete in either Zone 7, Region 1, Zone 7, Region 3 or the western version of Zone 7, Region 4 (found on our Zone 7, Region 5 page) for western. All times listed are Local Time. Show Schedule subject to change.